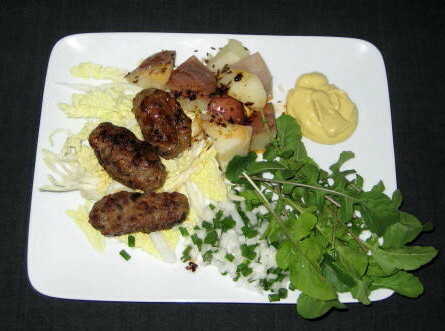 Cevapcici is a national dish of Balkan states that formed former Yugoslavia. It consists of grilled minced or ground meat (lamb, beef or pork alone or any combination) formed into an oval sausage and is served with chopped onions, mustard and potatoes or rice. Besides Balkans all countries of central Europe has their own version. Wikipedia has an excellent entry on this summer meal favorite. I prefer pork and lamb combination. In a large bowl, combine the ground pork, lamb, mustard and egg white. Add the garlic, salt, baking powder, sweet and hot Hungarian paprika. Mix well using your hands, and form into thick sausages about index finger long. Oil the grill grate and grill sausages for about 15 minutes or until cooked through, turning till all sides are light gold. Serve with boiled potatoes, chopped onions and mustard. I served my Cevapcici on bed of chopped Napa cabbage and arugula. Note: If grill is not available it is just as good to shallow fry with lard in heavy skillet. It takes about same time to cook on medium high heat.